Vamps are, simply put, short repeating musical sequences typically used for accompaniment. Being able to jam along side and accompany other musicians and instruments is a skill in itself, and this lesson will give you a reliable framework for doing this by showing you how to pull great sounding vamps from scale patterns. By using scales as the palette of tones from which we create a vamp, this allows us to create accompanying sequences for solos and melodies in that same key, ensuring everything fits together musically. 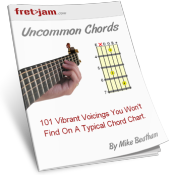 This is particularly useful if you want to create your own backing tracks to help you practice a scale or mode. But it's also useful for generating ideas for musical hooks that can be used as part of your songs. As demonstrated in the video, the easiest place to begin creating vamps is to use one of the bottom three strings as an open, static root note (as in a fixed bass) and build on it using scale patterns. So these chords become the lowest "starting position" for our patterns. While you go through the patterns below, also take note of where the root notes appear on other frets/strings. For example, in A major/minor we have our open A note on the 5th string, but we also have an A root on the 4th string at the 7th fret. Together, these root note positions give you a reference point for the key in which you're playing. Most major key music is written by harmonising the major scale. Any sequences used from this scale will also be compatible with major pentatonic. Tip: These patterns can look a bit overwhelming at first. As demonstrated in the video, start with just two strings, then build on your movements string by string. In some cases, two or three strings will be enough for a decent vamp! Tip: Where open strings are part of the pattern, try occasionally leaving strings open in your shapes/sequences for added vibrancy. Tip: Try both picking and strumming your vamps. Tip: Try adding in lead phrases around your chord shapes using available fingers. For a good intro to this technique, see the chord melody lesson. Tip: You don't have to stay within the scale. Use the scale as guidance, or as a starting point and see where your fingers (and ears) take you. Write backing tracks for practicing a related scale/mode. I recommend using Audacity to record your tracks. Allow you to confidently accompany vocals or other instruments in a given key. Give you a reliable framework for improvising harmony in a given key. Write your own hooks for songs. Also remember that you don't have to stick to one scale throughout. Once you're confident with a couple of individual patterns, try changing between them in the same vamp and see what you can come up with. This can even work switching from major to minor on the same root (e.g. major scale to melodic minor), known as a parallel key change. In the next part we'll be moving out of the open position so we can play confidently in other keys. Until then, have fun exploring these vamp patterns and please let us know your thoughts/ideas using the comments form below!